This story is part of Overview: Stories in the Stratosphere, a collection of science fiction stories, art, and speculative timelines exploring the near future of the stratosphere, published by Arizona State University’s Center for Science and the Imagination and edited by Michael G. Bennett, Joey Eschrich, and Ed Finn. From Star Trek and 2001: A Space Odyssey to The Martian, great science fiction stories have shaped how we think about voyages into deep space — but what kinds of gripping confrontations and adventures might unfold in near space, above the clouds? Overview provides several compelling answers to that question, created by renowned science fiction authors, working in collaboration with designers, illustrators, and experts in fields ranging from human spaceflight and signal processing to law and tourism. The book is free to download in EPUB and MOBI formats, as well as through Apple’s iBooks Store. Learn more at http://csi.asu.edu/books/overview. Antonia Rojas wrinkled her nose at the limousines crowding the roundabout in front of the billionaire’s house. Humvees and troop carriers crowded the drive, disgorging armed men in camouflage as the dignitaries exited the limos. Antonia tried not to be feel impressed as she rolled the wheelchair up the walk. Mister Garcia had nestled his multileveled, glass-and-adobe home at the foot of a vast sandstone butte. It loomed over the house like a proclamation. Garcia had positioned himself in front of it, hands clasped and a broad smile on his face. “Welcome, welcome!” he shouted. The migrants’ representatives had gathered on one side of the drive, as far from the government and army leaders as they could get. The two sides were eyeing one another suspiciously. Garcia strode down to stand between them. Predictably, a half hour of bickering followed. Antonia watched it contemptuously, arms crossed. Every now and then her hand went to her purse, half-consciously, to finger the glass vials. One contained Liliana’s heart medication. The other had in it a solution to the migrant problem, and to Antonia’s long purgatorial career as Liliana’s nurse and servant. Garcia had sorted the parties out, with the government ministers on one side, a couple of aides, Liliana, and her secretary on the other, and the one newswire reporter that both sides mistrusted the least. Antonia went along, uncounted and unnoticed, as the party walked along a paved path stretching around the base of the butte. “I don’t know, Ma’am, I …” What was that? Something was coming into view around the side of the butte. As it emerged into sight, Antonia’s eyes told her it was a cloud, but confused voices and people stopping and staring made her look more closely. Something vast and silvery, like the egg of an elemental god, reared into the sky behind the butte. “What is that?” The Minister of Foreign Affairs was pointing, his face all accusation. Garcia grinned. “You need a neutral place to hash things out,” he said. “Somewhere that’ll give you an overview of the situation.” He smirked at his own cleverness. “And somewhere you’ll be neither disturbed nor threatened.” He turned and pointed to a glossy white, rounded object like a bus-sized pill that sat on the ground below the huge diaphanous balloon. Antonia found herself sitting in a comfortable leather seat between a billionaire and a British journalist. “It’s just face-saving,” the journalist was saying. “That’s not even a thing,” said the journalist. Antonia looked away; as usual, she was being ignored. Nobody ever inquired whether the nurse had degrees outside of medicine. It simply wouldn’t occur to them that Antonia might have authored numerous papers on political theory, or that she’d run in municipal elections twice and only narrowly been defeated. She knew far better than these hatchet men and corrupt officials how to resolve the refugee influx problem. But no one was ever going to ask her. She had never been given a chance to make a difference in the world. That was about to change. A man in a pilot’s uniform, complete with peaked cap, sat down in the tiny lounge’s other chair. The pill-shaped vehicle had three such chambers, one at each end and one in the middle. Separating them were tiny sleeping chambers, like you’d find on a high-end train, as well as the cramped cockpit, kitchenette, and bathroom. “Shouldn’t you be at the controls?” she asked the pilot. He grinned, and gestured at the big round window behind him. Antonia was startled to see the ground falling away quickly. The government’s people had taken over one end of the pill, Liliana and her advisors the other. Getting them together was going to take a herculean effort; then again, Antonia would never have imagined they would share a tiny capsule like this one. For lack of something better, she said, “You do trips like this a lot?” To her surprise, the captain shook his head. “But hopefully not the last,” said the billionaire. He smiled at Antonia, seeming to actually see her. She couldn’t help but smile back. Garcia smiled, unfazed. “As a matter of fact, yes. Antonia has no answer to this utopian fantasy. Only somebody rich, who’d never had to struggle, could have come up with it. Garcia rose and said that they were nearing altitude. Antonia had to give Liliana her injection anyway. With a flutter in her stomach, she walked to the back-end lounge, her fingers toying with her purse, in which the vials nestled. She should just choose one at random. In some obscure way, she felt that this would absolve her of guilt. “It’s time,” she said as she entered. Liliana grunted impatiently. Everyone but her was crowded around the giant round window fitted into the end of the craft. As they reluctantly turned their attention back to politics, Antonia prepared the injection. Her hands had sought out the life-saving vial — whether deliberately or by accident, she didn’t care to know. While the two delegations took over the center lounge, Antonia explored her quarters. Little bigger than an airplane bathroom, the sleeper she would share with Liliana had two stacked bunks, just enough room for the wheelchair, and its own little window. She ignored that, but couldn’t tune out the sounds of vicious argument coming from the lounge. Nobody disputed that crops were failing everywhere. Drought had gripped the continent for more than a decade now. Millions were on the march, seeking better lives far from home. Such migrations had happened before — so many times, in fact, that Liliana’s people had erected shrines all along the vast river valley that fed the lowland plains. This was the path of her ancestors, Liliana insisted; her people had the right to walk it. To the government and their urban constituents, the migrants were trying to cause maximum chaos, for some unknown but clearly political end. If history and tradition drove Liliana, political considerations were what drove the ministers and generals. There had been no meeting of minds at the conference, and Antonia was sure none would be arrived at in this preposterous little shed in the sky. She cursed, balling her fists. The room was too small to pace in. Why was she hesitating? Liliana wouldn’t last the year anyway. She couldn’t save her migrants from camps, deportation, or worse. If the government had any spine, they’d have assassinated her themselves by now. The roadblock had to be removed. Something had to be done. Antonia’s backers among the oligarchs had given her the means, but it was up to her to act. Finally, it was Antonia’s moment to make her mark on history. The shouting had turned to silence. Antonia reentered the lounge, to find most of the delegates had fled to opposite ends of the pill. Liliana and the Minister of Foreign Affairs were standing by one of the huge windows, bickering about something. “No, that’s the border there,” the minister was saying. They were clearly trying to reconcile the maps in their minds with what they were seeing. Antonia stepped next to them, and for the first time, looked out. The horizon curved, a white line smearing into blue. The blue in turn faded quickly to black, a startling darkness contrasting with the stunning luminescence of the lands below. She had seen mountains from above, looking through the tiny windows of airliners. Such windows made everything look small. This one, though — she could fall through it, take the whole damn delegation with her. It was obvious from here that it was she who was small. “Well, what is that?” Liliana pointed with a shaking finger. The whole great valley was visible to Antonia, carved between two mountain ranges. The mountains were clear, a herringbone of wrinkles all oriented to point to the lowlands between them. There, the river drove with merciless inevitability towards the sea. Far up the curve of the Earth, another river was pouring into the valley, this one white and broad. “Cloud,” said Antonia, and the word hung between the three of them for a long minute. The mountains funneled cloud banks bigger than cities into the valley. They channeled the water, cutting ravines and tributaries, inexorably finding the low point, carving the river over millions of years. Nothing could deny that shaping hand. It was suddenly utterly obvious to Antonia, and it must have been to Liliana and the Minister of Foreign Affairs as well, as they hesitantly met one another’s eye. It wasn’t tradition driving the migrants down the valley. It wasn’t politics. Everything — air, water, tumbling boulders, birds and flocks, lions and, yes, humans, flowed together in one stream through a channel so vast that, from inside, it was literally impossible to see. “We should call the others back,” said Liliana. Antonia’s hand rolled the vials in her purse. She couldn’t stop staring at the sight. The Earth rolled out of view on all sides, you couldn’t take it in all at once, and no amount of head-turning and neck-craning could reveal all its details. Yet it was obviously just one thing. From far away in space, she’d heard, the world was just a pale blue dot. She’d never realized what that meant before. She laughed and shook her head, ignoring Liliana’s suspicious glare. Antonia had never felt so small, and yet somehow, realizing how trivial she, and the migrants, and the government and the plotting oligarchs were … somehow it lifted a weight off her shoulders. If humanity was too small to make a mark on the face of such grandeur, then her own ambition was simply silly. Make a difference! She laughed again, and when she looked down at Liliana she saw not a scheming leader, but a fragile old woman whose life she had been entrusted with. Liliana was looking back, uncertainty in her eyes for once. 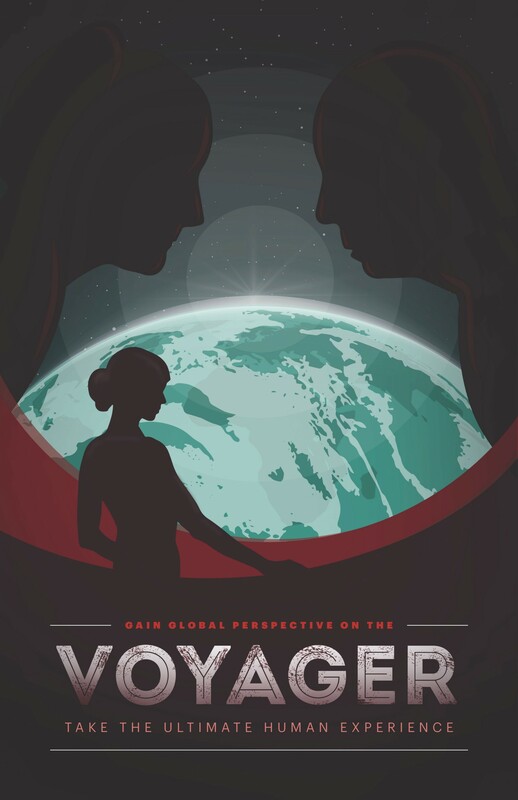 The team that collaborated with Karl Schroeder on this story was focused on tourism in the stratosphere, and included Kathleen Andereck, Bob Beard, Claudia Kelly, Kirsten Newkirk, and Karin Valentine. To read the rest of Overview: Stories in the Stratosphere, and to see more original art for the project, visit http://csi.asu.edu/books/overview. Building diverse networks of people to imagine and create research-based visions of the future. Learn more at csi.asu.edu.